Batch image editor, resize/scale/rotate/flip images. Is there a better alternative to ResizeMe? Is ResizeMe really the best app in Image Editing category? Will ResizeMe work good on macOS 10.13.4? 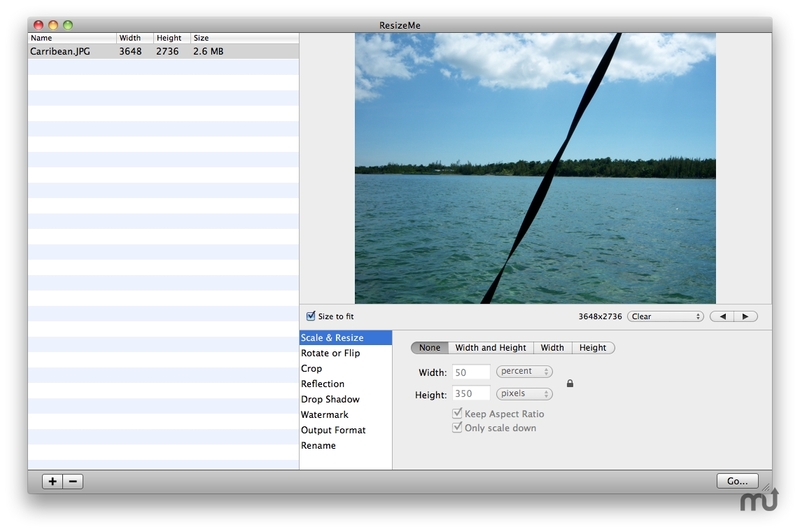 ResizeMe is a powerful, easy-to-use batch image editor for Mac OS X. Scale, Crop 'n Rotate: Perform the bread-and-butter operations of scaling, cropping and rotating your images with ResizeMe. Drop Shadows: Polish up your images and icons in one go with this all-time favorite of all image effects. Reflection Effect: Another favorite among Web designers and graphic artists, and just as easy to do with ResizeMe. Watermarks: You want to add a copyright notice, or add a "DRAFT" or "SECRET" stamp to your images in one scoop? ResizeMe allows you to add text watermarks and choose the position, font and rotiation. This update adds presets and fixes some bugs, and is recommended for all users. Convert Formats: You need to convert your images and photos from one format to another? ResizeMe supports conversion between a large number of common image and photo formats, including JPEG, PNG, TIFF and PDF. Live Previews: ResizeMe lets you preview all your image edits so you can fine-tune them before you commit changes.